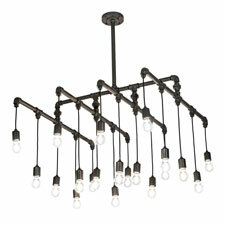 Shown is the 36-inch square PipeDream Alva 20 Light Cascading Pendant (model 201071), which highlights Clear Coated Pipes with matching hardware. Each stem features an Edison styled bulb for beautiful ambient illumination. The PipeDream family is custom crafted by highly skilled artisans in Meyda’s 180,000 square foot manufacturing facility in Yorkville, New York. Custom sizes, designs and finishes are available. The fixtures are UL and cUL listed for dry and damp locations.